As a new freelance writer, one of the skills you need is researching blog topics for your clients. Understanding which sites to go to or which sources to link to is important to not only wow your clients but to show your credibility as a freelance writer. So, when you have a brand new freelance writing job and that client doesn’t supply content ideas, what do you do? Check out my latest YouTube video on finding some topics for your freelance writing client. Make sure to subscribe to my YouTube channel too! So after reviewing the video, I hope, now you want to know what’s next? Here are the steps you should do after you figure out some pitch-worthy blog topics for your freelance writing jobs. 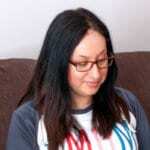 I would email several blog post topics to your client. Depending on the client, you may only have to write a couple of headlines or dive deep into each topic. For some of my clients, this is what I do. Once you email the client, you just wait. Fun times eh? Once the client approves a topic or gives more suggestions, it’s your turn to turn that outline into a blog post. With research. Just like you did for finding blog post topics, you do the same for researching the topic – if you are unfamiliar with the topic. 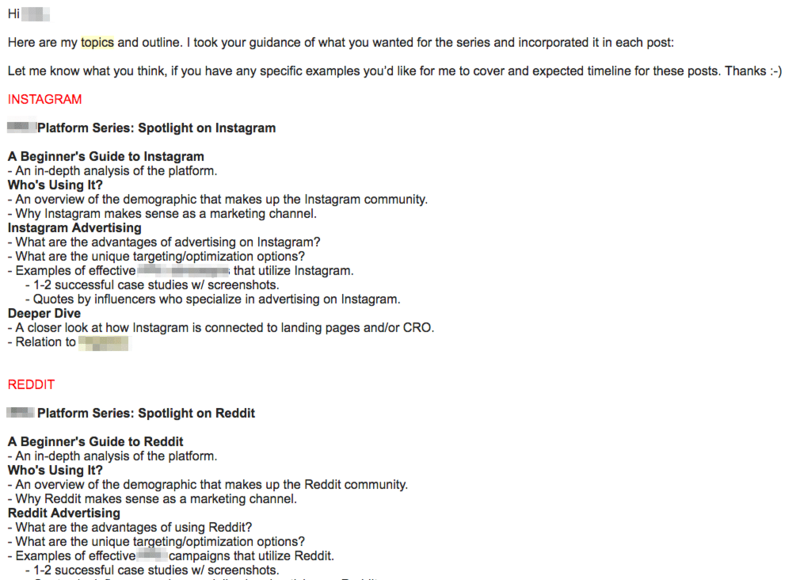 For example, I don’t know much about Reddit, but if the client approved my Reddit post, I’m going to spend most of my time researching it. Since I broke my outline down, I have a top-down writing process. This means it’s hard for me to start in the middle of the post or do the ending first. I have to start from the beginning. For me, this sets the tone and engagement level of my post. So, figure out what works for you in terms of YOUR writing process. I usually spend a day or so researching the topic. I may put a website next to a subheading so that when I write the post, I can refer to that post and link to it if necessary. I know some of you can be perfectionists, but let me tell you that doing this won’t scale your business. You have to let go of that and just write. Write your first draft and know it’s crap. Let your writing sit for a day and then go back and edit. Read the introduction and make sure you have a hook that draws a reader in. Look at your explanations and see if you need to break it down even more. Finally, look at the formatting. Do you need to add a bullet list? Do you need to break up the paragraphs more? Depending on the client, you may submit the post via Google Docs or in an email. I like to create a zip file as I usually have screenshots and images in my post. This opens up the dialogue and any revisions requested (which is usually none). Again, depending on the client, you may request half payment up front, invoice them right after you hear the client got the post or after a set time. I usually invoice monthly for most of my clients as I have recurring projects with them. For brand new clients, I do invoice right after I get a notification they received and enjoyed my post. I hope that helped. 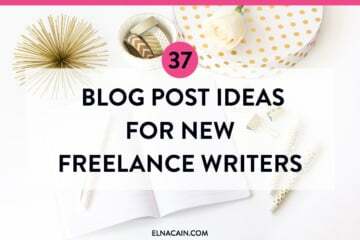 Finding contents idea for your freelance writing clients can be a challenge if this is totally new to you. Know that Google is your friend and it’s okay to get inspired by other posts that write about the same topic you are writing. As long as you infuse your style of writing and your expertise in that topic, your post will be authentic and not generic. Let me know in the comments how you come up with topics and the process of submitting to your client! I’d love to hear your projects! 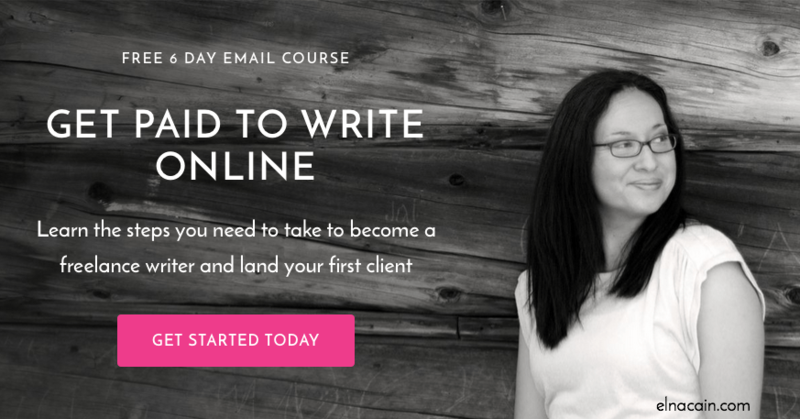 Check out my free course to help you land that first freelance writing job! Thank you for another excellent post and video. 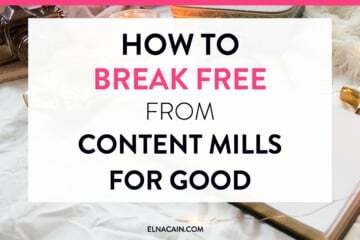 I find that whatever information I need as a new freelance writer, your blog comes up in my results with the exact resources I’m looking for. Keep up the awesome work! Hey Elna…I just wanted to say as a new freelance writer, I am so grateful for the information you have provided. Any questions I needed I found my answers on your blogs. So far I have received the free classes and now I’m excited to purchase “write to 1k” Thank you so much! Thank you so much! I’m ecstatic you want to be a freelance writer! Yay! And thank you for enrolling in Writeto1k! I am beginning my venture into freelance blogging. I have been drawn to it over the past few years but just didn’t think I could do it. This year I am making it a goal of mine! Your information has been so helpful! I will definitely be following you! That’s fantastic to hear. I’m so happy this is the YEAR for you! Good luck! You’re welcome! Glad you liked my video and post! I find that Quora is a great place to get content ideas. Even if you are not answering a question, the questions themselves are inspiring. Most people read content because they are looking for information and help. The Quora questions always give me insight as to what is on people’s minds. It helps me understand the challenges and problems they want to solve. This helps me come up with ideas I can then submit to potential web clients. Awesome post, as usual! I’ll admit that I haven’t watched the video yet but it’s on my “Watch Later” playlist on YT so I’ll get to it soon. But I enjoyed the rest of the content of the post a lot. I hadn’t thought of creating zip files to send the attached images and screenshots to clients. That’s a great idea! I’m sure it looks much more professional that way. I’ll definitely start to do that from now on. I also liked your invoicing system. I always wonder when I should invoice my clients. I think I’ll start to do the same as you and wait for the client to say they liked the post before sending the invoice. I usually send it as soon as I send the post but I hadn’t thought of the case where they may ask for revisions. Because my rate is directly linked to the number of words in the post, that may be a problem. Aww thanks so much! You made my week! No, my month!!!! 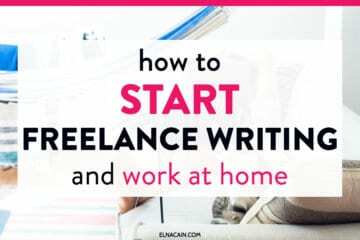 I’m so glad you are finding little tips that can help you be a better freelance writer. Thanks for showing us how you present your ideas in a logical manner to potential clients. New to the blogging and freelancing environment and can get all the help I can! Thank you so much! I think showing new freelance writers the little things like how to pitch ideas to clients is a gold nugget for sure! Thanks for coming over! you use to get ideas thanks for sharing. Thanks so much! Glad you found some content ideas for your freelance clients!